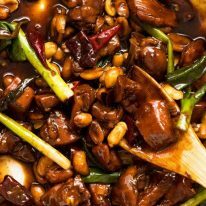 Take out style Kung Pao Chicken with marinated chicken, the signature sweet-sour-salty Kung Pao sauce with the addictive tingling heat from sichuan pepper. 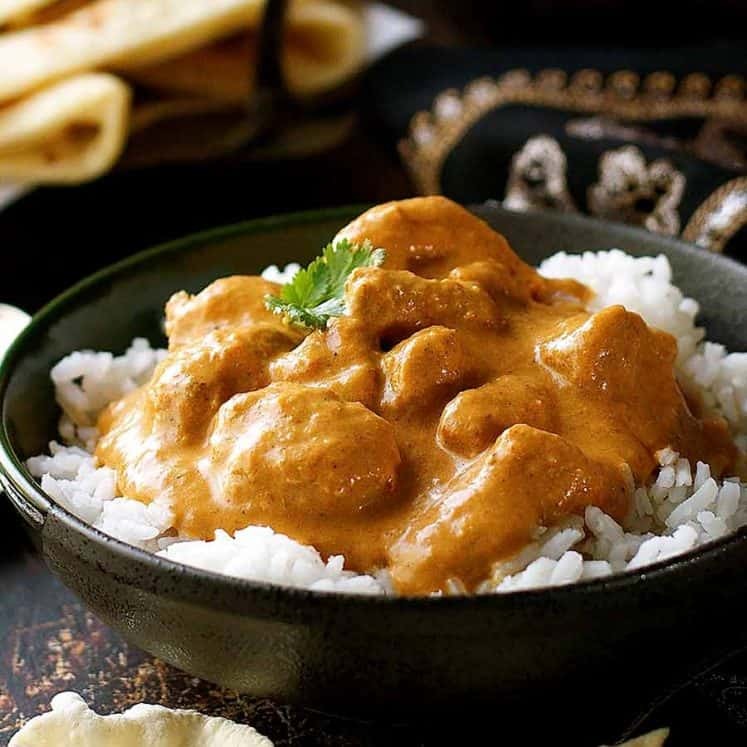 It’s an explosion of big, BIG flavours – and it’s a really quick and easy recipe. 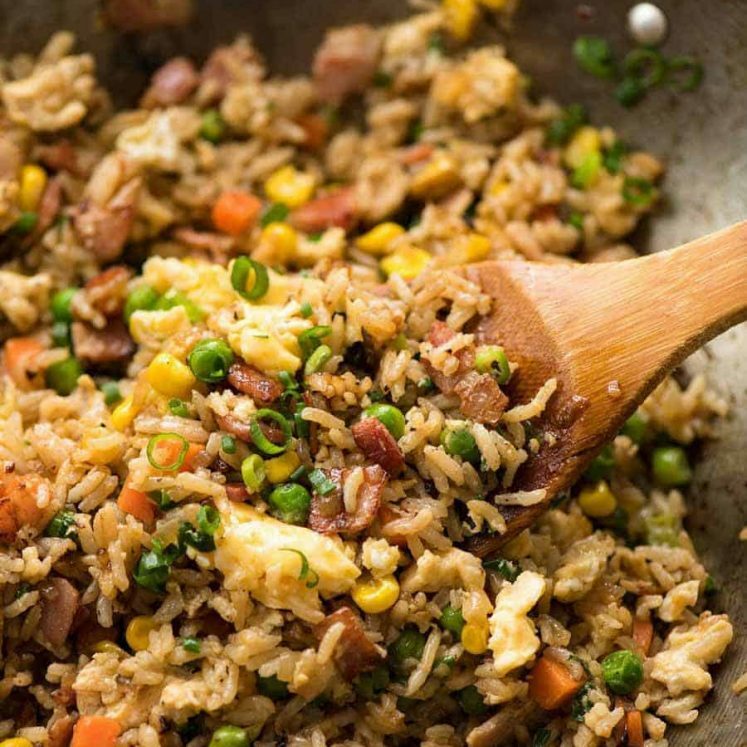 Serve this with Fried Rice to complete your takeout at home. 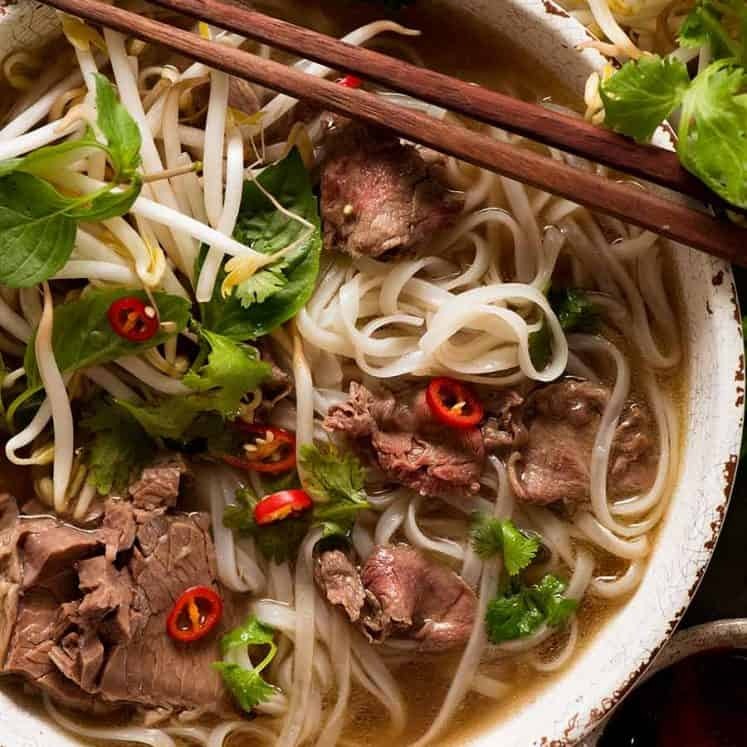 Or go all out with a Chinese banquet with Spring Rolls or Hot and Sour Soup to start, plus more mains like Chow Mein and Beef and Broccoli! Kung Pao Chicken – flavour explosion! 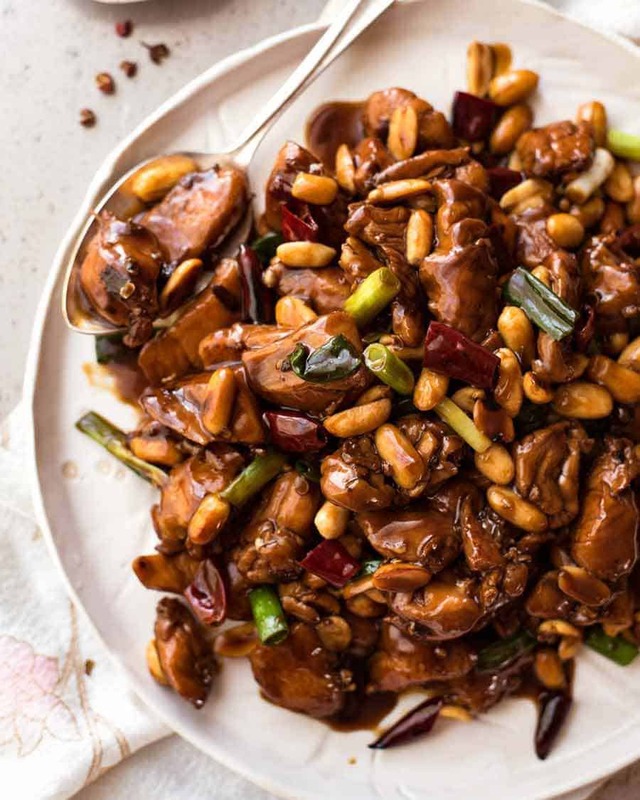 Kung Pao Chicken is a Chinese takeout favourite that is mouthwateringly good and highly addictive – so it’s a good thing it’s easy to make at home so we don’t need to order takeout every time we crave it!! We love the strong flavoured sweet-sour-savoury sauce with the signature tingle of numbing heat from the Sichuan pepper! 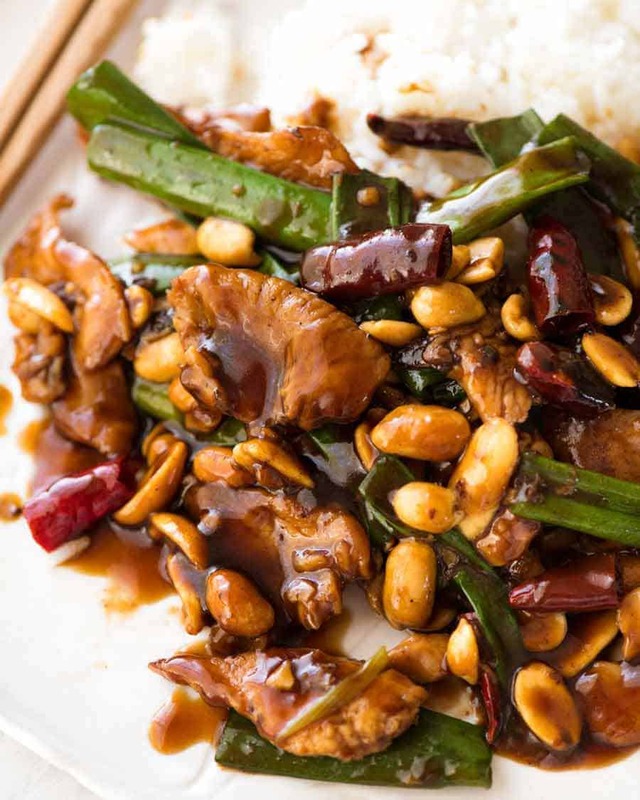 If you’re wondering whether Kung Pao Chicken is authentic Chinese, the dish as we know it outside of China is a slightly westernised version of an authentic Chinese Sichuan dish. 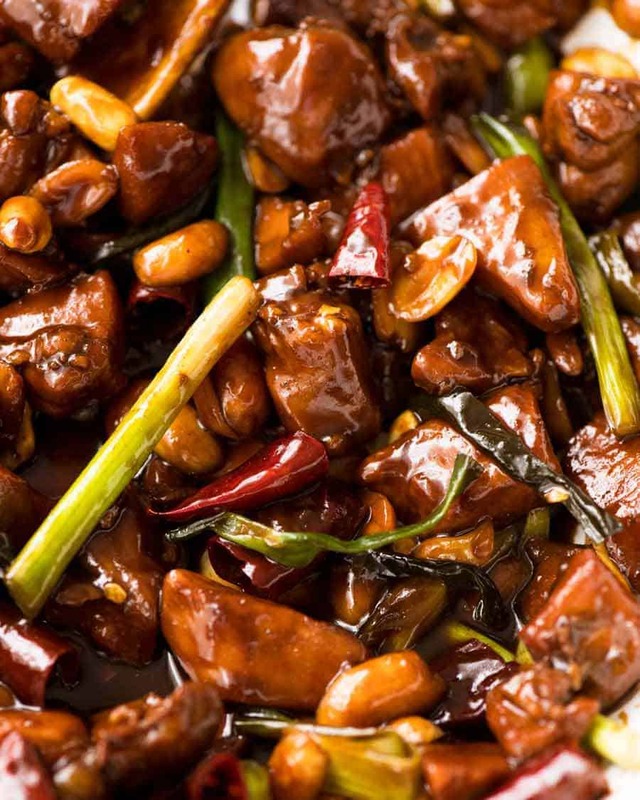 Traditionally in China, Kung Pao Chicken is a dry stir fry. Which means, unlike 99% of other Asian stir fries on my site like Chop Suey and Cashew Chicken, it’s not swimming in loads of sauce. But with Kung Pao Chicken, the sauce is very intense flavoured so you don’t need loads of it. When it mixes in with the rice, just a bit of sauce goes a long way. Most of these ingredients are pretty mainstream Asian cooking ingredients. I’ve provided substitutes for the Chinese cooking wine in the recipe. I like to use chicken thigh because it’s juicier than breast and tenderloin. 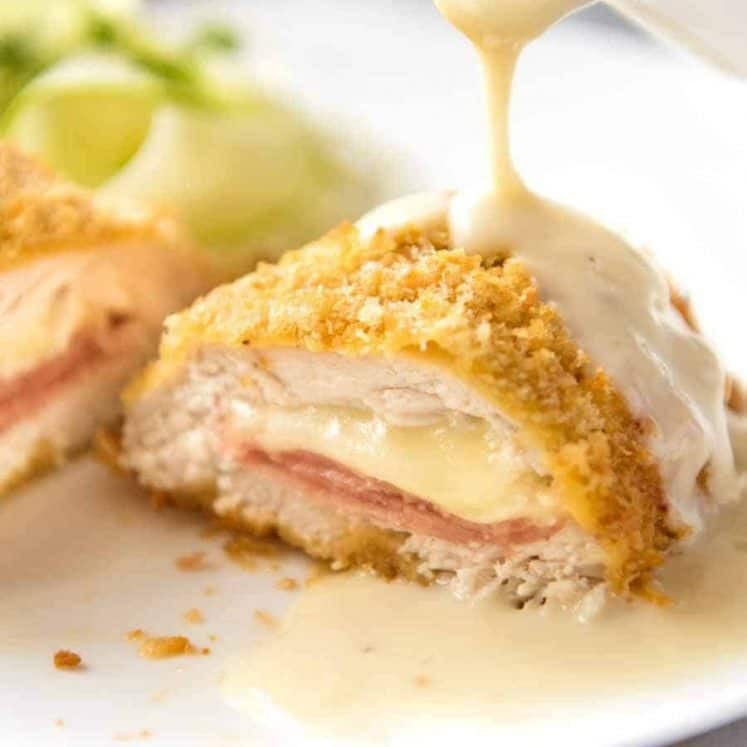 If I make this with chicken breast, I always tenderise it using a Chinese restaurant technique using baking soda (bi-carb). 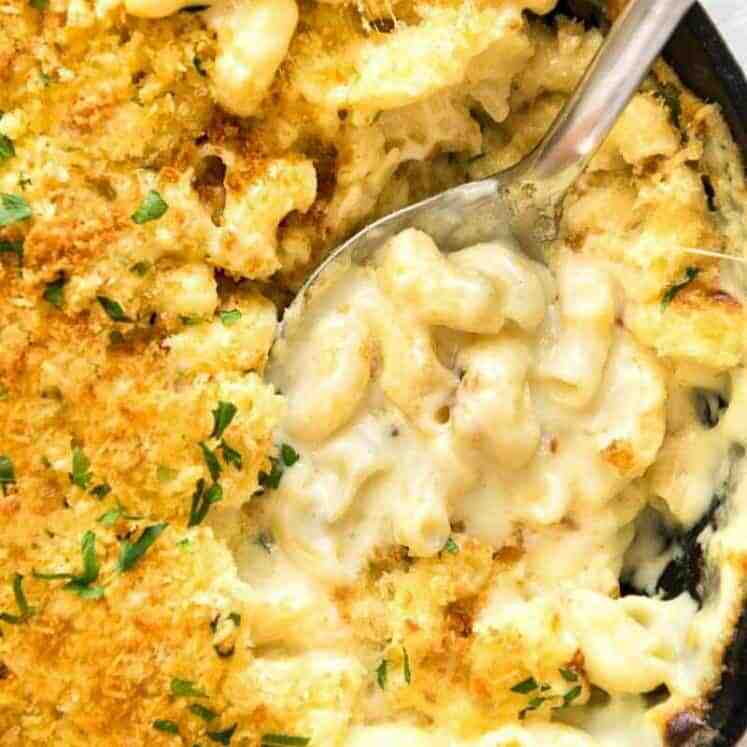 It’s super simple, see directions here: How to Velvet Chicken. This is the ingredient in Kung Pao sauce that makes it Kung Pao and not just any type of stir fry sauce. I describe it as a little bit lemony with a numbing spiciness, rather than hot spiciness like almost every other chilli. I used to use whole peppercorns but nowadays I tend to use pre ground both for the convenience and also because it’s finely ground. In contrast, if you grind your own, there tends to be little gritty bits in it – albeit the flavour is a bit better. Best substitute for Sichuan pepper is white pepper. 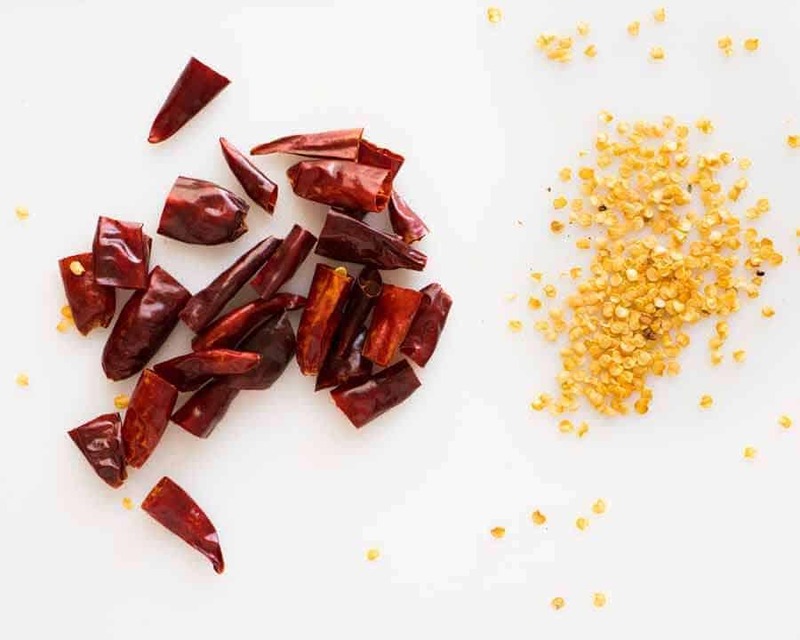 Not all dried chillies are created equal and in fact, the same type of chillies can vary in spiciness throughout the year. So for dried chillies, always taste them and make a judgement call on how much you can handle! Most of the heat is in the seeds which are removed. If you really don’t think you can handle any chilli at all, use them when cooking but don’t eat them. The chillies add flavour to to sauce so don’t skip them. What does Kung Pao Sauce taste like? Kung Pao sauce has a strong flavour that is sweet, sour, savoury and with the signature tingle of heat from Sichuan pepper. 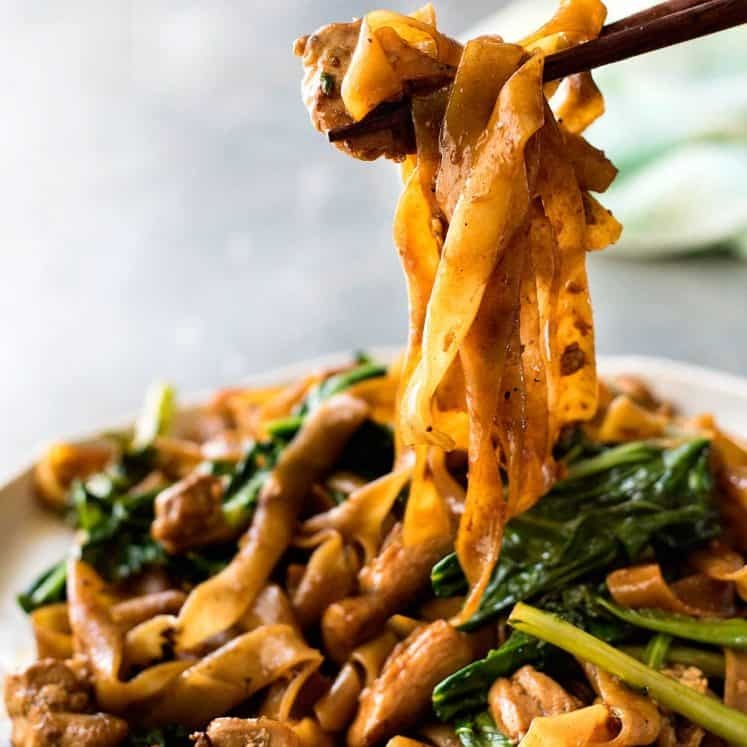 It’s glossy and thickened with cornstarch / cornflour, and because it has such a strong flavour, this stir fry has less sauce than other Chinese favourites like Cashew Chicken and Beef and Broccoli. Looks like balsamic vinegar and, surprisingly, tastes vaguely like it. Available in Asian stores and costs only a couple of dollars for a big bottle. 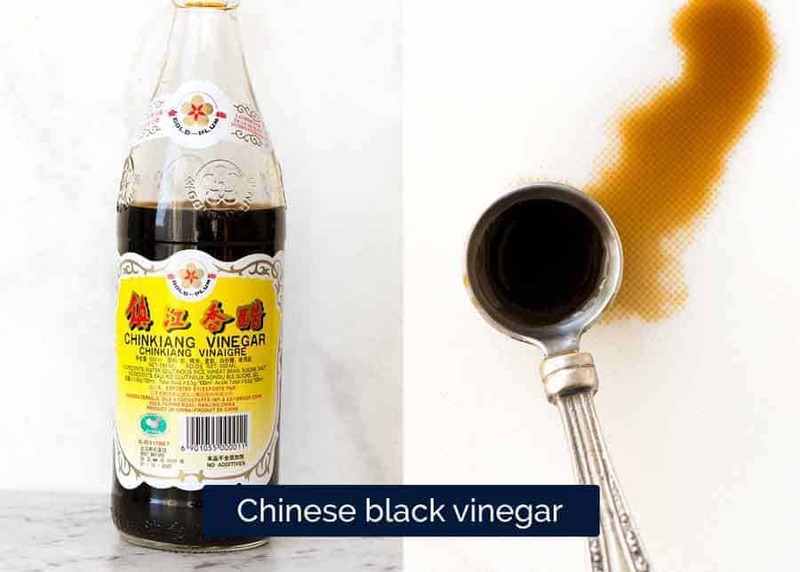 Be sure not to get Taiwanese or another Asian black vinegar (some taste completely different), make sure you get Chinese black vinegar (read the label!). 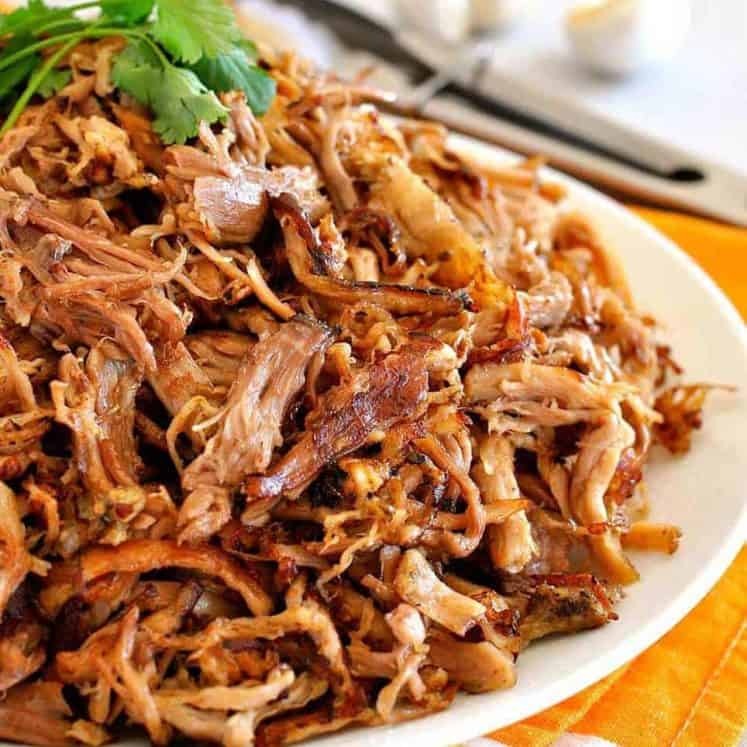 If you can’t find it, don’t worry, you can use rice wine vinegar, plain white vinegar or even balsamic vinegar. 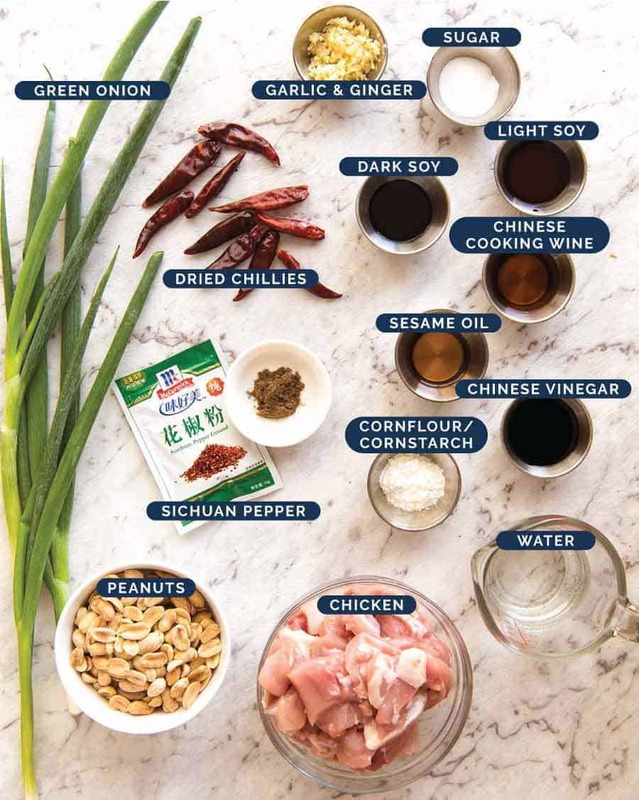 I’ve made Kung Pao Sauce so many times and tried it with each of these, and it’s actually quite similar. As with most stir fries, once you start cooking, things move quickly! 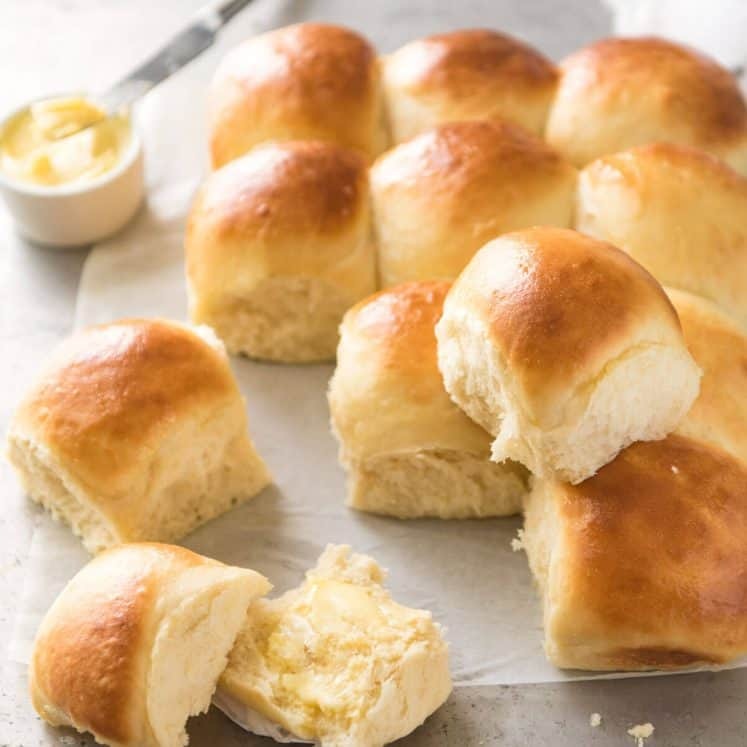 It takes about 6 minutes to cook. So make sure you have all ingredients prepared and ready to toss in. 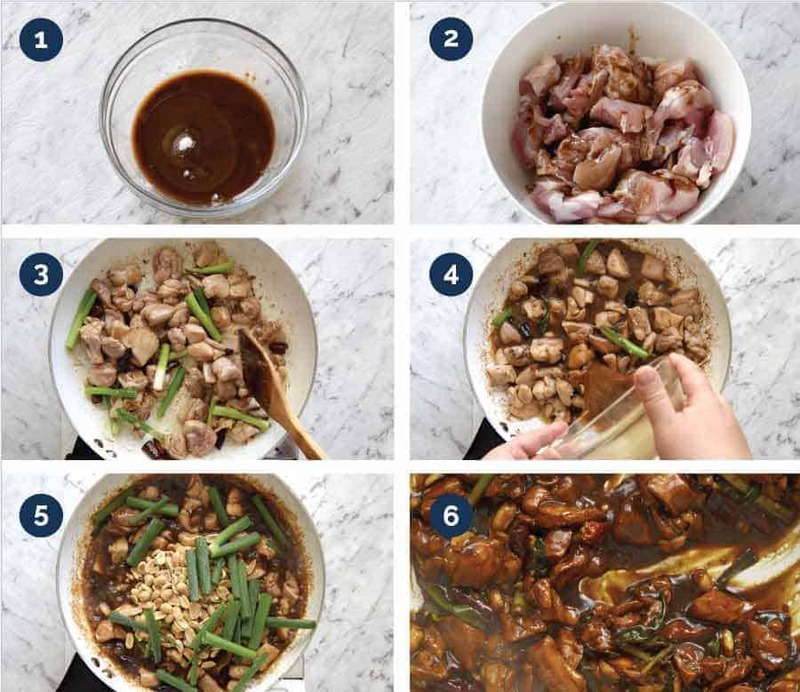 Key Tip: Cook the Kung Pao sauce down until it reduces to a syrupy consistency with quite an intense flavour. That’s the Kung Pao way!! Recipe video above. 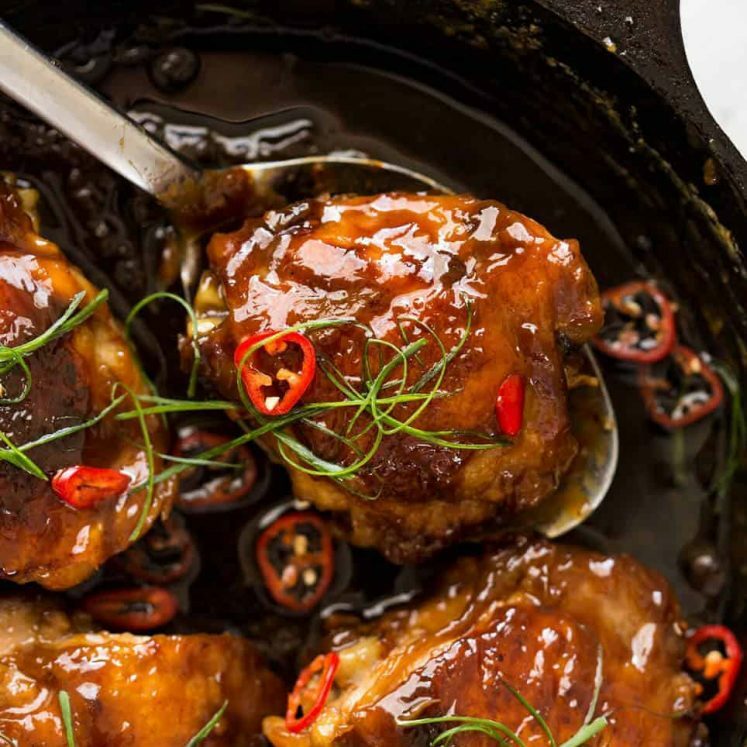 Kung Pao chicken - done right! The flavour of this sauce is very similar to proper restaurant versions, with a great balance of savoury-sweet and sour with the numbing tingle from Sichuan pepper. Use whole Sichuan peppercorns if you have them, otherwise ground is fine (which is what I use). Mix cornflour and soy sauce in a small bowl until cornflour is dissolved. Then mix in remaining Sauce ingredients EXCEPT water. 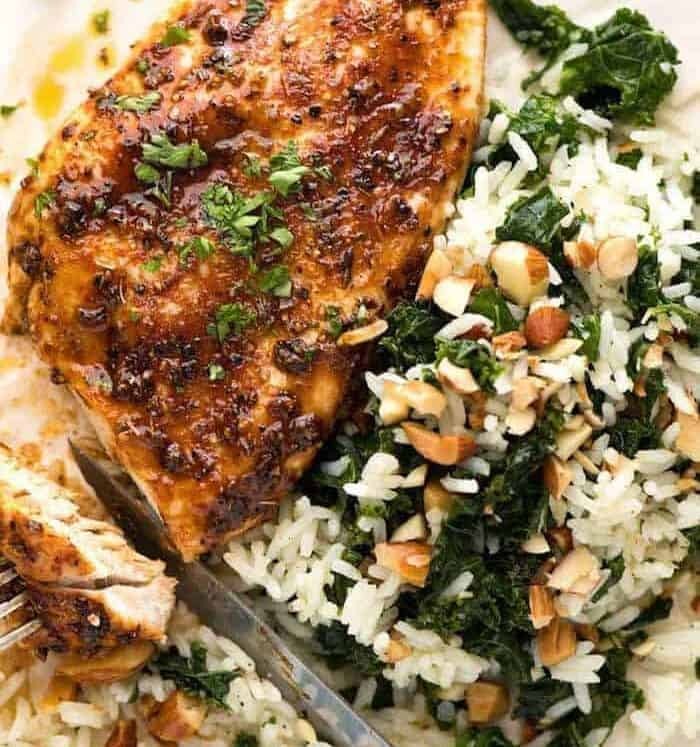 Pour 1.5 tbsp Sauce over chicken. Toss to coat, set aside for 10 - 20 minutes. Add water into remaining Sauce. Heat oil in wok over high heat. Add garlic, ginger and chillies. Cook for 30 seconds or until fragrant. Add chicken, cook until it turns white, then add the white part of the green onions. Cook until chicken is cooked through - about 2 minutes. Add Sauce and Sichuan pepper. Bring to simmer, mixing constantly, until almost all the sauce reduces to a thick syrup. Just before the end, mix through peanuts and green part of the green onions. Also check spiciness - add more Sichuan pepper if you can handle the heat! 2. Light Soy Sauce is saltier and lighter in colour than all purpose soy sauce (like Kikkoman). The bottle will have "light soy sauce" written on it. It's available in large supermarkets - e.g. Coles and Woolworths in Australia. 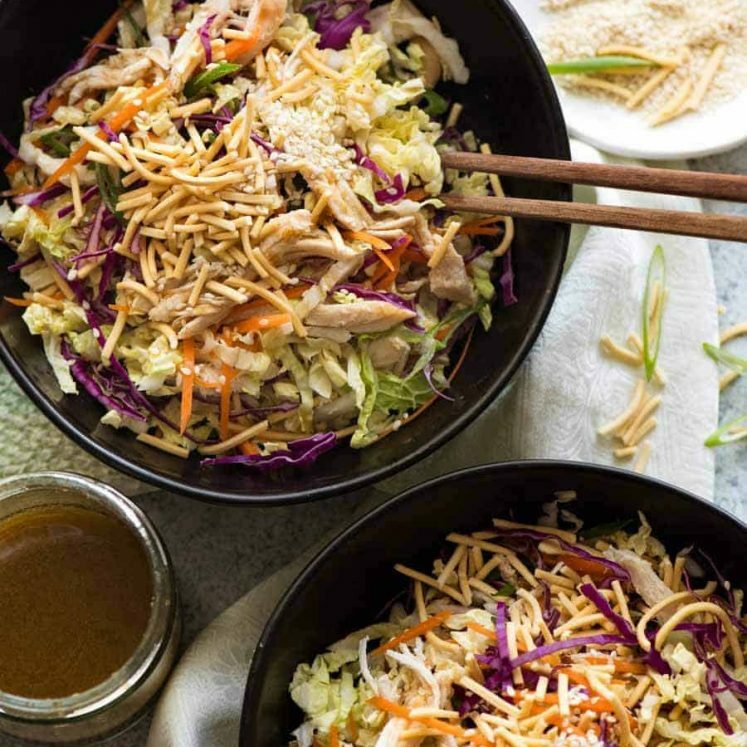 It can be substituted with all purpose soy sauce - like Kikkoman. 3. Dark Soy Sauce is much darker in colour than Light Soy Sauce has has more flavour. The bottle has "dark soy sauce" written on the label. 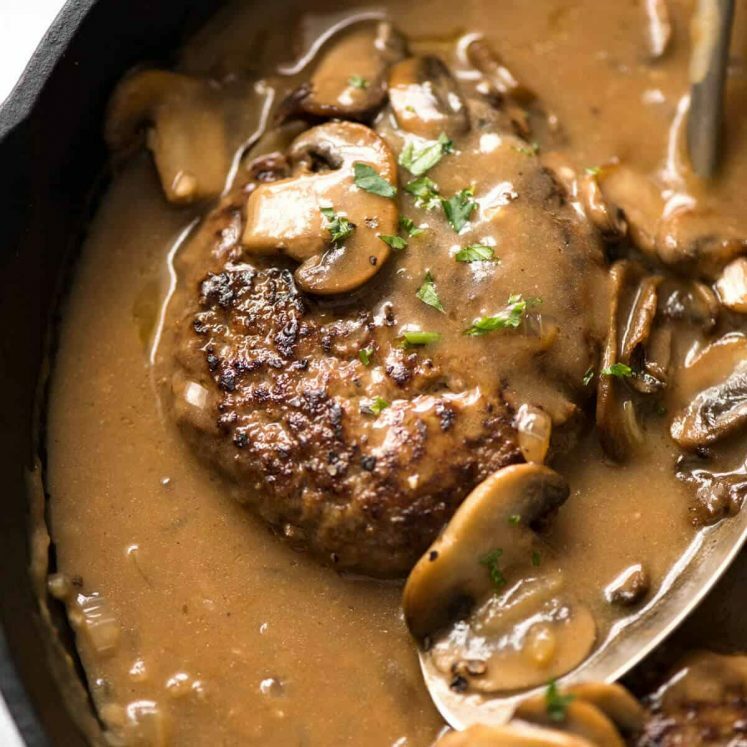 This is mainly to darken the colour of the sauce so if you don't have it, you can substitute with all purpose soy sauce or even with light soy sauce. 4. Chinese black vinegar for the sour is the authentic way of making it. It looks like balsamic vinegar, tastes like it too but with a slight savoury edge. It's available at Asian stores and some large supermarkets. 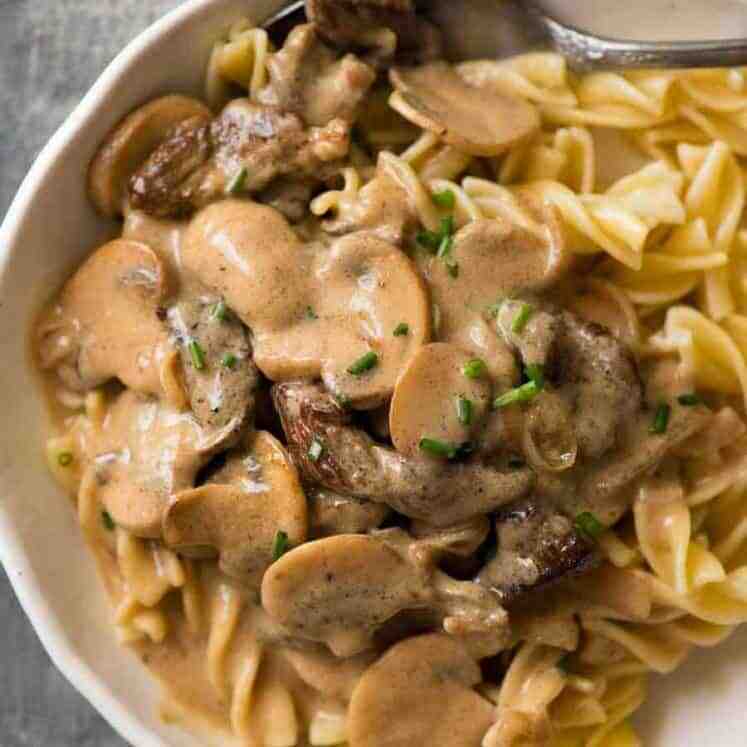 Substitute with 1.5 tbsp of rice wine vinegar, or 1 tbsp white vinegar or even a mild balsamic vinegar (plain one). 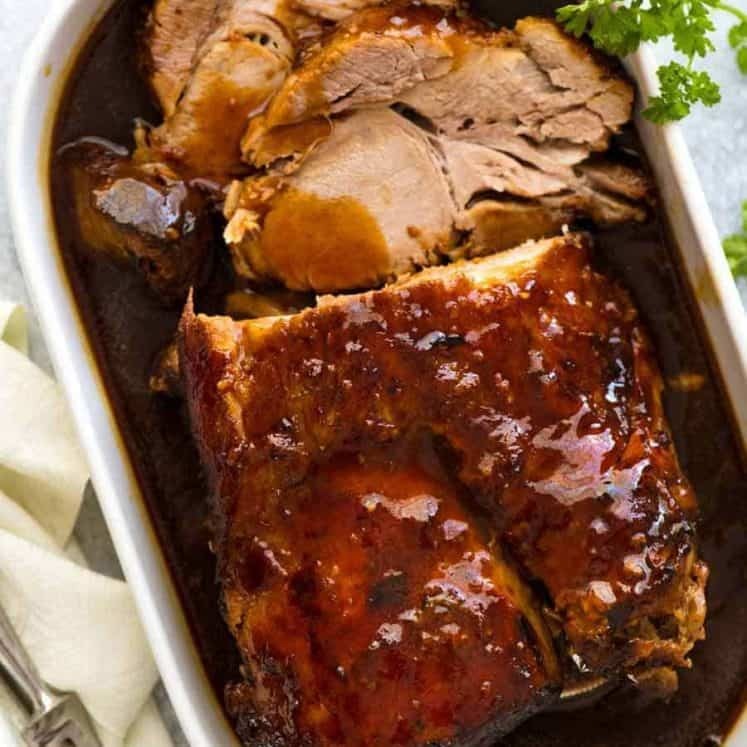 Do not use Taiwanese black vinegar (which is also sold at some Asian grocery stores), it tastes like sour Worcestershire sauce and it changes the flavour of this recipe. Bottle label will say "made in Taiwan". 5. Chinese Cooking Wine is also called shaosing / shoaxing wine, see here for more information. 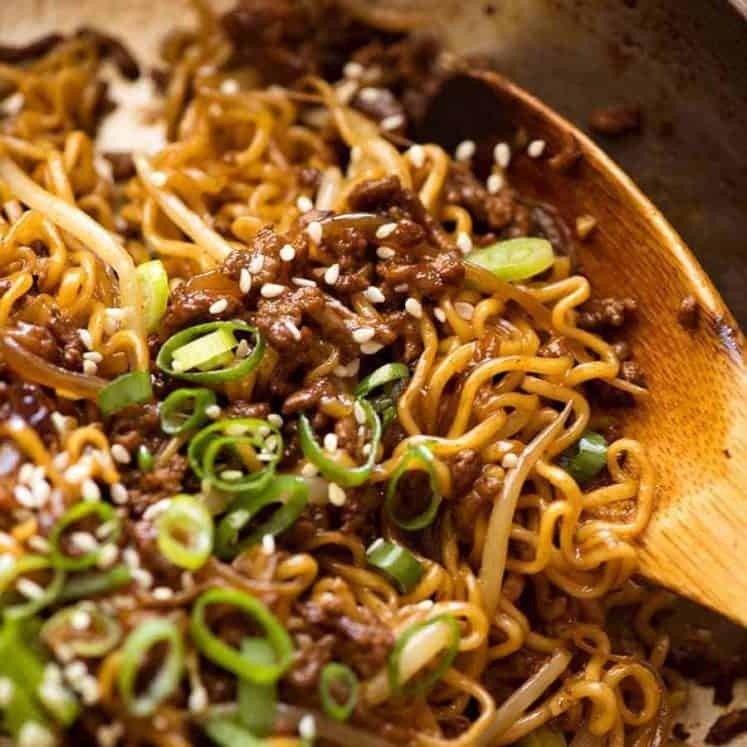 It's the ingredient that makes recipes truly taste like what you get at Chinese restaurants. Substitutions: dry sherry or mirin (if using mirin, skip the sugar) or Japanese cooking sake (rice wine). If you can't consume alcohol, then skip it but use chicken broth in place of water. 6. Sichuan peppercorns are not that spicy, they sort of make your mouth numb. In a pleasant way! I used to grind my own but nowadays I just buy ground. If you grind your own, toast them in a dry pan first then grind - it will have slightly better flavour but you get grittiness. Taste first for spiciness as I find that the spiciness varies. Add more at the end if you want more heat. They can be purchased at Asian grocery stores, fruit & veg stores that stock spices and some supermarkets. In Australia, they can be purchased at Harris Farms. In America, I am told that sichuan pepper is sold at Wholefoods! 7. Dried chillies: I find that the spiciness of dried chillies drastically differs from brand to brand! So adjust this to taste. Cut off a tiny bit of the chilli and check how hot it is, then decide how many to use. I typically use 6 dried chillies that are around 6 - 7cm/ 2.5" long, deseeded. 8. Nutrition per serving, Kung Pao Chicken only assuming chicken thigh is used. 150 calories of this is attributable to the peanuts. Re-united. Life is back to as it should be! I had a problem when I made this, I think it was the sichuan peppercorns. They tasted bitter. Any suggestions? Me or the brand of peppercorns? Hi Sharon, they are supposed to have a slightly bitter/numbing flavour. It’s hard to tell, it could be the brand or how old the peppercorns were but it shouldn’t be overwhelming at all! I tried it and was delicious. I tried it from a restaurant before and was a bit different, with green and red peppers and shrimp! Can you tell me how to make it with shrimp and peppers? Made this for dinner last night. Took the time to go to the asian supermarket and get all the correct ingredients. It was an absolute winner. 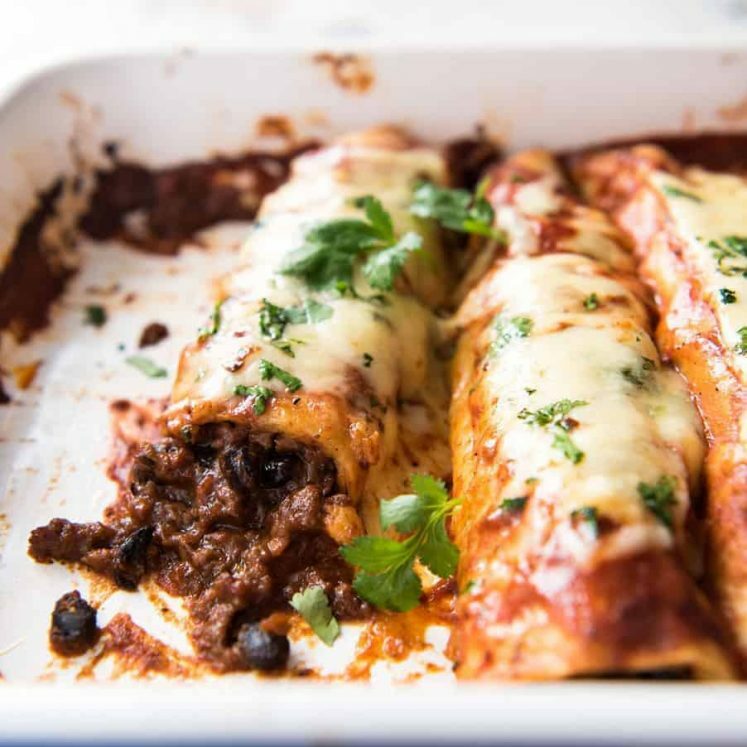 The flavour was amazing and so quick and super easy to make. Next time i think sliced red capsicum would be nice in it. WOW!!! Great recipe! My wife and I couldn’t stop eating. Definitely a keeper and will make again soon. Nagi my iPad has lost the chicken wings Ebook I bought can you tell what app I can find it in thank you. The improvements to this recipe rock! Love the sauce! 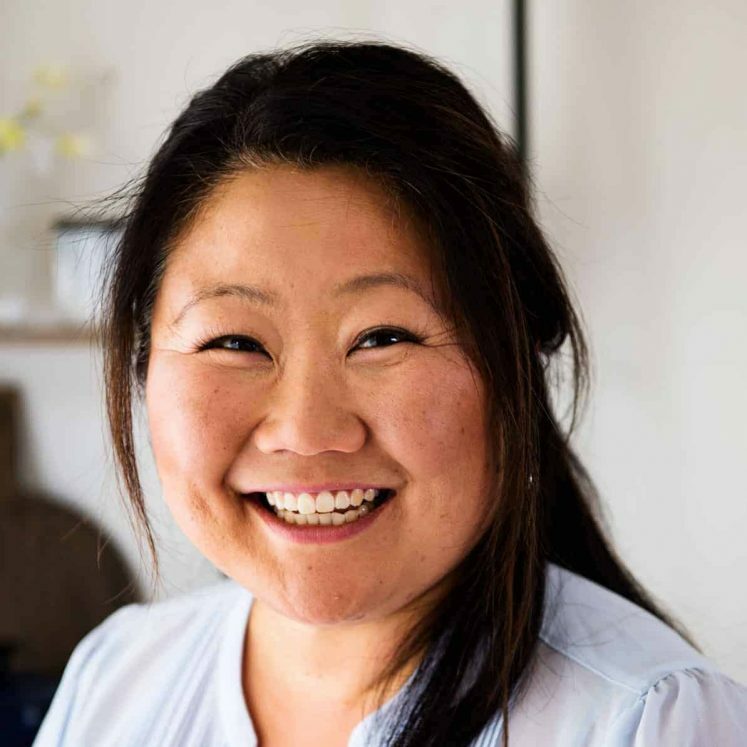 Hi nag, love your recipes! Just made the kung pao chicken and it was no exception – delicious. I was wondering if there are any other vegetables you might consider adding to it (and perhaps increase the sauce margin as well). I was thinking broccoli might go well with it? What are your thoughts? 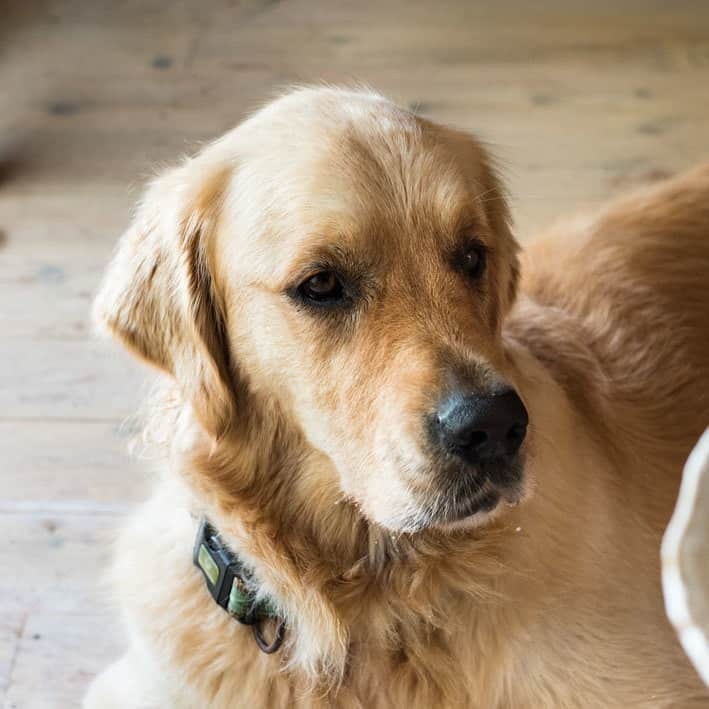 your food is great and your puppy looks so happy! Hats off no word to say. And the picture is awesome. I bought your e-book for photography and learning step b step. I have a question. Which camera and lens you have used for this shot (KUNG PAO CHICKEN) only this shot i need to know. I make a lot of your recipes and my daughter always wants to know where I get them from…. “I have a secret Australian Japanese lady online….” Haha! Tried your Kung Pao Chicken recipe last night which is very out of character for us as we don’t do ‘hot’ but am also cooking for a niece who recently had a baby and has no time to cook. OMG! Who knew that those little red peppers (without seeds) would put such a different hot into this that even I liked! This is going to be a regular meal for us now with maybe just a fewer peppers for my husband’s sake. Thank you from Calgary, Canada! 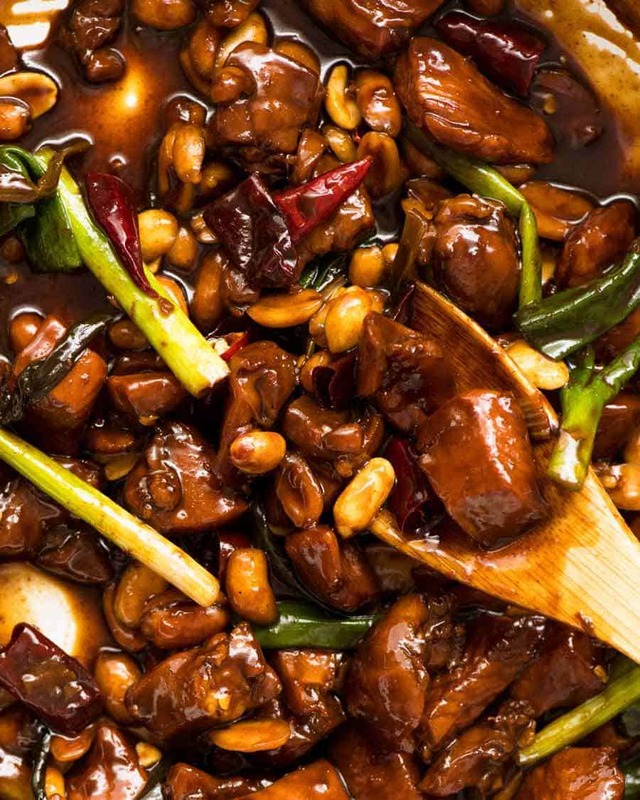 The first time I tasted Kung pao chicken, I was fascinated with how nice it tasted with the peanuts. Now I have the recipe and will try it. Glad to see Dozer back with his favorite person! I’ve been wanting to try a Kung pao chicken recipe for the longest time, and this is just the push I needed to get me to do it! A big thank you for sharing your trip! As usual your recipes are great! Welcome back I am sure Dozer was overly enthused to have you back. Sichuan pepper use a lot just bought on market the other day. Would roll meat in it for BBQ, YUM. ALSO ITS USED IN MIDDLE EASTERN COUSINE. ITS GOOD TO HEAR YOU GOT BACK SAFE. YES YOU ARE RIGHT ABOUT TRAVELING TIMES. SOME TIMES IT CAN BE 30 or more hours if you need to go from mine City . Dozer back Happyly in water. We got good weather since w/ end, was hot yesterday but nights are just as hot, 20 C. Now for 3 – 4 days overcast- dark morning humid and thunder bit of rain needed much more. We have pre Xmas market from country with food, garden stuff and art. Bought first time From SA walnut oil, prunes in port, vinegar with pepperberrys olive tapenade and kids Xmas gifts. Got newborn over in Singapore. So am GETING ready it’s NOT LONG NOW TIME FLYS WHEN YOU HAVE FUN!! Have SPECIALY good w / end. I’ll second water chestnuts as a must have ingredient. 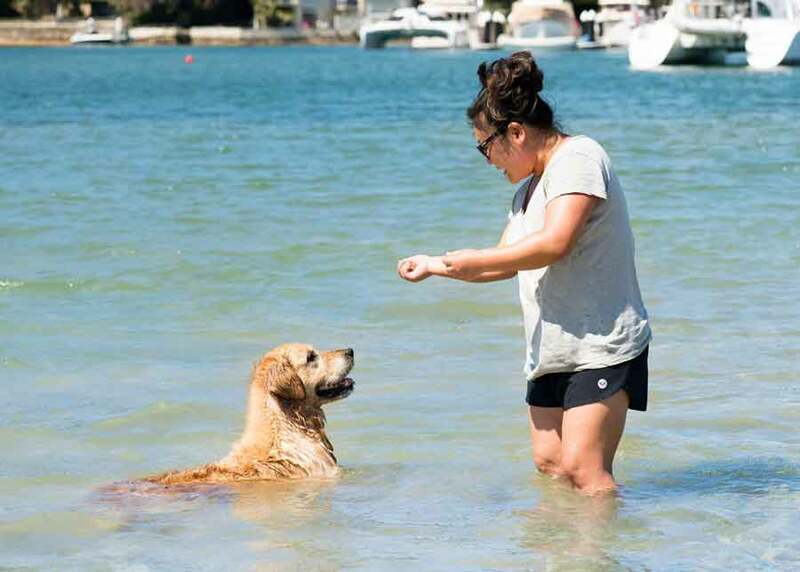 Hi there my lovely Aussie friends Dozer and Nagi, wonderful to see both of you in the WATER,unfortunately they only water I will be experiencing is in gym! !😂😂 we are slowly counting down to cooler weather a low near 3 celcius tonight! !..so KUNG PAO is definetly on the map to spice things up.. I love stir fries too N, but without the chillies! 😂 I sometimes put water chestnuts in for a nice crunch.